Schwartz & Wade, 9780375866906, 40pp. 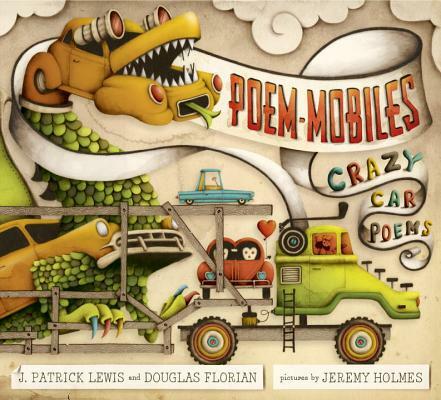 The U.S. Children's Poet Laureate and an award-winning children's poet join their prolific forces in this picture book of poems about cars. But they're not just any cars: there's the "Sloppy-Floppy-Nonstop-Jalopy" ("So unique there is no copy"); the Bathtub Limosine ("With hot water heating / And porcelain seating"); and the "High Heel Car." Each of the thirteen quirky, inventive poems will speak directly to the imaginations of children, as will Holmes's high-concept, detail-filled illustrations. J. PATRICK LEWIS, the U.S. Children's Poet Laureate, is one of the best known children's poets writing today, and the author of many celebrated picture books. His books include Doodle Dandies, Please Bury Me in the Library, and First Dog, as well as two previous S&W titles—Kindergarten Cat and The Fantastic 5&10¢ Store. DOUGLAS FLORIAN is the creator of many acclaimed picture books, including Dinothesaurus, the recipient of four starred reviews; Comet, Stars, the Moon and Mars, a Kirkus Reviews Best Book and a Horn Book Fanfare; and Bow Wow Meow Meow, a Gryphon Award winner. JEREMY HOLMES's first book for children, There Was an Old Lady Who Swallowed a Fly, received the Bologna Ragazzi Opera Prima Award. He also created the jacket image for On the Day I Died by Candace Fleming.